Inova T4/X3R Rechargeable Lithium Ion Battery is your answer to endless hours of needed energy wherever it might be required. 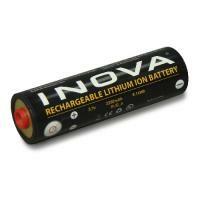 The Inova T4/X3 has a rechargeable shelf life of ten years and will work just as well on the 364th day of the 9th year as it will on the first. Inova's lithium T4/X3R battery will keep your flashlight lit in the dark of the night, and has endurance that sets an industry standard for performance. Although I purchased 2 spare batteries, so far I have not had a need for them as the battery gets recharged before using the light again. They will be handy on extended trips away from the vehicle. I do wish they came in a plastic sleeve to prevent the possibility of shorting out in pack or pocket.